Looking at how technology has grown in the past year, it's clear there's been a massive surge in augmented reality (AR) and virtual reality (VR). While nearly every industry has taken advantage of these technological advancements, one industry is steadily funneling millions of dollars and hours of time into it: the gaming industry. The gaming industry reported over $100 billion in revenue in 2017, and AR and VR combined brought in $4 billion of that total revenue. The gaming industry is taking advantage of the direction that technology is headed, and they're not slowing down. AR and VR are two of the fastest-growing genres of games and companies like Apple, Google, Sony and HTC are investing their time and money to help game developers create the latest and greatest games. Before we dive into the various games, let's first understand the key differences among AR and VR. How are AR & VR Different? While AR and VR both have the unique ability to alter users' perceptions of the world, they are inherently different in terms of how they achieve this goal. VR can be thought of as transposing the user to a different place completely, transforming the user's surroundings and almost tricking them into thinking that they are somewhere else simply because their perception is blocked off to the outside world. Of course, the user isn't physically leaving their current place and being transported to another, only their perception is changing. On the other hand, AR is simply taking the user's current perception and adding something more to change it, typically through the device's camera and screen. Their reality is literally "augmented" to make it appear that something is there when it isn't. Both AR and VR seek to change the user's perception of the world. The gaming industry has taken this mindset and rolled with it, creating gadgets like the Oculus Rift, Samsung Gear VR and Google Daydream to bring virtual reality to life. Mobile games like Pokémon GO, ARise and Stack AR have been developed to add more elements to users' lives. The gaming industry has found their stride and it's not going to die down anytime soon. There are dozens of games out there that change users' perception of the world and, thanks to technology built into most smartphones, these games have been developed so that users can access them whenever they want. 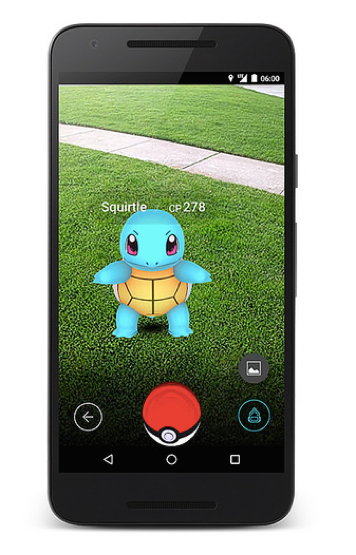 AR Games: The most notable AR game to date was Pokémon GO, which was released in 2016. Within three months of its release, the game had already generated $600 million in revenue. This game exceeded everyone's expectations, but due to a variety of factors, users started dropping off and the game lost its initial spark. However, the app still has roughly 5 million daily users and 65 million monthly active users according to the game's developer Niantic. Because of Pokémon GO's success, other game developers have come onto the scene and created mobile games that let users see the world as Iron Man, run with dinosaurs and more. The technology is being utilized both in games and for learning, education and even shopping apps. Additionally, mobile device manufacturers are starting to put more focus on their device's ability to run AR games. For example, Apple's latest iPhone models have introduced AR+, designed to provide an enhanced augmented reality experience. Along with AR+, Apple created a better platform called the ARKit so developers could build these new AR games. The development of AR is only going to continue growing across both iOS and Android devices. VR Games: Companies like HTC, Google and Samsung have stepped onto the scene by creating and releasing devices for Android phones that allow users to experience virtual reality. While some of these headset devices are very expensive (Samsung Odyssey VR, $400), there are also options that can be built at home or cost next to nothing (Google Cardboard VR). However, for the chance to play such games as InCell VR, Adventure Time: I See Ooo VR, and Hunters Gate, it's a small price to pay. Not all headsets are the same. Some include remotes or controllers, so users can not only see a different reality but interact with it. These add-ons allow the game to track a users' movements to be able to reach out and "touch" objects, characters and more. VR is truly a way for the gaming industry to bridge the gap across various platforms, and is currently set to surpass 14 million units by 2020. Developers are actively creating more VR games for mobile devices and are constantly trying to change the way that they change users' perception. The future is bright for AR and VR, which are set to continue growing in the coming years. Now that companies like Apple and Google are fostering the growth for more augmented and virtual reality games, the genre is only expected to blow up in the coming years. Additionally, companies like Samsung and HTC are seen to be prime players as they develop more devices for mobile VR. No matter how you look at things, the gaming industry is producing AR and VR games to meet market demands. These developers are still actively creating new games, meaning that the market is expanding and more competition is arising. This means that developers need to incorporate an App Store Optimization (ASO) strategy to make sure that eager users can find their apps. Overall, AR and VR games are a fun way for users to escape our reality and change their perception. With the reactions that gaming has garnered in recent years, the technology is only expected to continue growing to keep changing people's lives.